Manage the your website's content by logging in and using LocalSignal. In order to edit the content on a LocalSignal website, you must first navigate to the page you'd like to edit. Select Pages from the Website Sub-navigation on the left main menu. Pages displays all of your websites pages in an organized manner called a Sitemap. Highlight the name of the page you wish to update by clicking on it. Page content will be editable on the left. The page preview will be displayed on the right. Click on the Panel titles on the left of the page to view the editable website content. LocalSignal uses Panels to divide a page's content. Each Panel used in the layout have a corresponding module in the content editor. There are different types of LocalSignal editable fields used on each website. Text: One line input field for text on the page's content editor. Textarea: Multi-line input field for text on the page's content editor. Content: Rich Text Editor (WhizzyWig) that allows formatting, headings, links, lists, and more. Menu: Select a Menu to be used from a dropdown list of Menus available. To add or edit a menu, navigate to the Menus section under the website heading. Link: Allows the user to specify the link location and text in the content editor. 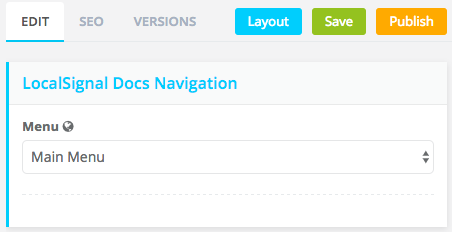 Select / Dropdown List: Gives users a defined list of options in the content editor. Only one option can be selected. Maps: LocalSignal Maps allow users to utilize Google Maps on their website. Users can input an address, map hue color, map water color, map zoom level, and a map marker. Forms: The Form tag allows users to select from a list of LocalSignal Forms. Image: Upload or select an images through the LocalSignal page editor. Background Image: Allows users to upload or select a background image to be used on a designated area. Video: Easily embed a YouTube video. Global Content on a website is shows a Globe Icon next to the Name of the input. Modifying a Global Input on one page will update that content on every instance of the panel throughout the website. The page's SEO tab provides a way to update the pages settings in order the improve the website's results on search engines such as Google. Here you can update the Page Name, Page Title, Page URL, and Meta Description. Name of the Page displayed in the App. Title used for search engines and browsers. The relative path for a page on your website. The description used by search engines to convey the page/website content. A chronological list of changes made on the current page. Select a date to revert back to published and unpublished versions of the page. Layout allows you to edit which panels are used on a page. This means rearranging, adding, or deleting panels. Warning: Removing panels from a page layout with data causes the data to be deleted. LocalSignal has a Store Panel Layout feature that allows developers to save a page’s panel layout in order to be applied across multiple pages. The Apply Panel Layout feature utilizes Stored Panel Layouts to set up new pages. You can only Apply Panel Layouts to pages that do not currently hold any panels.